A cooking container that is made of natural clay in a variety of sizes to evenly and slowly cook foods such as meats, poultry, seafoods, and vegetables. 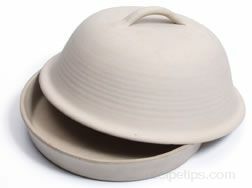 The clay roaster is round or oval shaped with a domed lid that seals the juices in, retaining the nutrients as the food cooks in a moist environment. This type of kitchen utensil can typically be used in both conventional ovens and microwave ovens.